As part of this trend, it is growing more common for foreign students studying here to apply for work at Japanese companies and go through the traditional job-hunting process. Japanese firms have been expanding overseas for a long time. Why are they now focusing on foreign students in Japan? The global financial crisis in 2008 seemed to be a trigger, said Hitomi Okazaki, editor in chief of the Rikunabi website, which offers an employment service matching companies and applicants. “To survive and expand under those tough economic conditions, firms accelerated globalization of their businesses and recruitment of global human resources,” she said. While some companies initially tried to hire students at universities overseas, they have shifted their attention to foreign students in Japan because these young people are familiar with both the Japanese and foreign cultures and languages, and can adjust more flexibly to Japanese companies, Okazaki said. How many Japanese firms plan to increase hiring of international students in the next fiscal year, which starts in April? 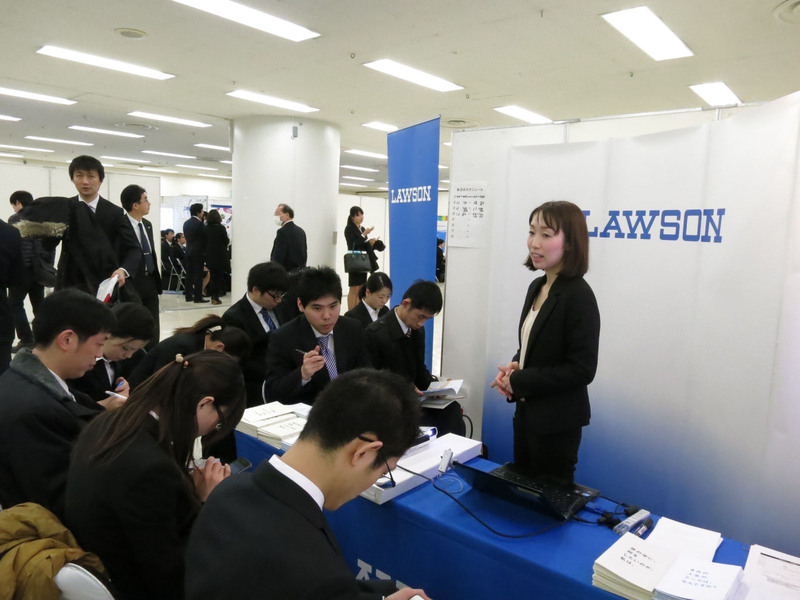 According to a survey conducted last May by Disco Inc., a Tokyo-based recruitment consulting firm, 25.9 percent of the 1,136 companies polled said they planned to hire foreign students in fiscal 2013, up 5 percentage points from the previous year. Larger companies are more willing to do so. For firms with more than 1,000 employees, 48.2 percent said they want to hire non-Japanese, an increase from 36 percent the year before. Are international students actually landing more jobs at Japanese companies? Yes, and the increase has been dramatic over the past decade or so. In 2000, 2,689 students obtained a work visa after landing a job at a Japanese firm. In 2011 the number had risen to 8,586. The peak was in 2008, when 11,040 foreign students found work here. The drop in 2009 and 2010 was apparently due to the global financial crisis that forced companies the world over, including in Japan, to reduce hiring. Meanwhile, it is also true that the overall number of international students in Japan has increased sharply in the past decade. Data from the Japan Student Services Organization, a semipublic body, show that while there were 64,011 foreign students in Japan in fiscal 2000, more than twice as many — 138,075 — were here in fiscal 2011. Will opportunities for international students continue to increase? Outside factors like the general economy can always affect any trend, but the trend to hire international students is apparently spreading out from Tokyo. The Kansai Economic Federation, a major economic-business organization that consists of 1,400 member companies, compiled a report last November saying Japan as a whole isn’t doing enough to encourage international students to work for Japanese firms, even though globalization in the business world has accelerated. It said about half of the foreign students hired in Japan are concentrated in Tokyo, and the Kansai region doesn’t even top 10 percent. The Kansai Economic Federation will launch a new organization in fiscal 2013 to support the job-hunting process for international students. It is setting its sights on increasing the number of foreign students to land work with companies in the region by 30 percent by fiscal 2014 compared with fiscal 2011. Okazaki of Rikunabi said more companies will probably try to hire foreign students in the coming years, but that doesn’t mean they’ll succeed. This is because the number of students coming to Japan from other countries has been stagnant in the past few years due to such factors as the strong yen and the March 11 earthquake and tsunami, she said. If Japan is unable to attract more foreign students, the competition will be more intense among companies for the ones who are here, Okazaki said. What kinds of companies tend to seek out international students? Companies in all sorts of fields are hiring foreign students, provided the firms are actively expanding overseas. This makes it much more likely the trend will mostly be seen in big companies. For instance, nationwide supermarket operator Aeon Co. is aiming to widen its presence in other parts of Asia in the coming years. In addition to hiring 1,500 people overseas in fiscal 2013, up from 1,000 the previous year, the firm wants 50 percent of its employees at its headquarters to be non-Japanese by fiscal 2020. 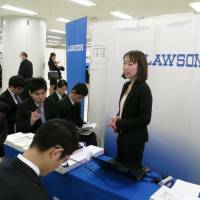 An Aeon spokeswoman said jobs for foreign students studying in Japan are likely to increase in line with the company’s plans to expand in Asia. Small and midsize firms are also interested in hiring foreigners these days. However, it can be hard for them to attract students because of their lack of name recognition, according to people in the recruitment industry. To help the situation, Future Design Lab, a Tokyo-based consulting firm, launched a website called Dragon Gate on Feb. 4. Companies looking to hire international students and place recruitment ads on the site can view profiles of students who have registered with the service. Information available to companies includes reviews of students conducted by Dragon Gate staff through counseling sessions, and videos in which the students introduce themselves. Many international students would like to work at firms with strong growth potential, but they are likely to be unfamiliar with small and medium-size companies, so the site aims to make it easier for students and such firms to find each other, Future Design Lab said. Are more international students willing to work for Japanese firms? Another Disco poll conducted on 332 foreign students in February 2012 found more than 90 percent wanted to work at a Japanese company. Trading companies were the most popular among male and female international students studying humanities. Many male students majoring in science-related fields hoped to work at electronics makers, while chemical firms were popular with female students. During a career forum for international students held in Tokyo’s Ikebukuro district on Feb. 19, Wu, who studies economics, said he has yet to narrow his search to a specific industry but hopes he can find work with a company that is operating overseas. Do international students also go through Japan’s time-consuming job-hunting process? Many go through the process right alongside their Japanese counterparts. Also, numerous forums have been held especially for international students, and the participants wear the dark-colored “recruitment suits” and intently listen to company briefings, just like Japanese students. At last week’s forum in Ikebukuro, hundreds of students mostly from Asia checked out various companies’ booths.